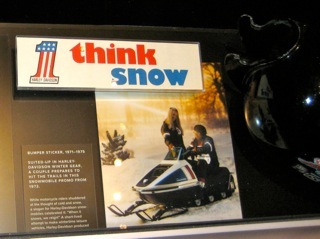 Nothing like a little real-life danger to provide the backdrop in promoting a product. Harley-Davidson is doing just that with the live streaming of the attempt at the world record jump on a H-D motorcycle. Seth Enslow will be trying to break Bubba Blackwell’s record by leaping 160 feet across the front of Sydney Harbor, at Sydney’s Barangaroo, East Darling Harbor Waterfront – a world record. 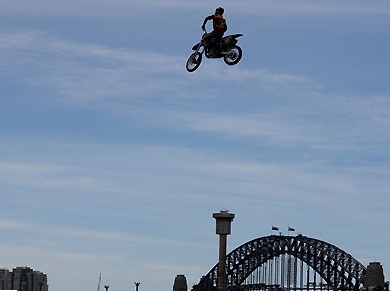 The jump will be attempted on a H-D XR1200 with the Harbor Bridge in the background. The jump will stream live March 2nd starting at 9:15am Australia EST. This is happens in less than an hour. The campaign is being heavily promoted with a special micro-site HERE, the Australian YouTube H-D branded site HERE and on twitter HERE. Nothing like the possibility of a death to bring in the viewers! UPDATE: 3:15 PST — SethEnslow is the new record holder after breaking the previous record held by Bubba Blackwell. The streaming video was fraught with technical issues, and we had to put up with advertising, but in the end we did see the jump live from Sydney. Seth made it look too easy. Congrats! Photo courtesy of Cam Sinclair.